In the opening pages of the canonical Learning from Las Vegas, architectural theorists Denise Scott Brown, Robert Venturi, and Steven Izenour attack the Modernist attitude towards art. They note that while art was common in Modern architecture, it was always an overlay, a non-intrusive affectation, secondary to the architecture. In the quote above we see not only a critique of Mies and his Modern cohort, but also a not-so-subtle comment on the old boys club of Modern architecture. Begun as research for a design studio at UCLA in 1966 by Brown, Learning from Las Vegas caused instant controversy and heralded the end of Modernism with a renewed interest in the discussion of the symbolic in architectural design. The work of Jill Daves and Natalya Hughes would make Scott Brown very happy. Both artists are painters, obsessively creating discrete objects of intense complexity and surprising simplicity. But they also work with architectural space as a medium. Distorting, disguising, and exposing it as an augmentation to their paintings. Daves sees the gallery as an object with a physical history of use and misuse. Hughes manipulates architecture with overlay, decontextualizing the space with wallpaper or perverting the white cube with repurposed domestic objects. Both artists freely transition between the wall and space of the gallery. 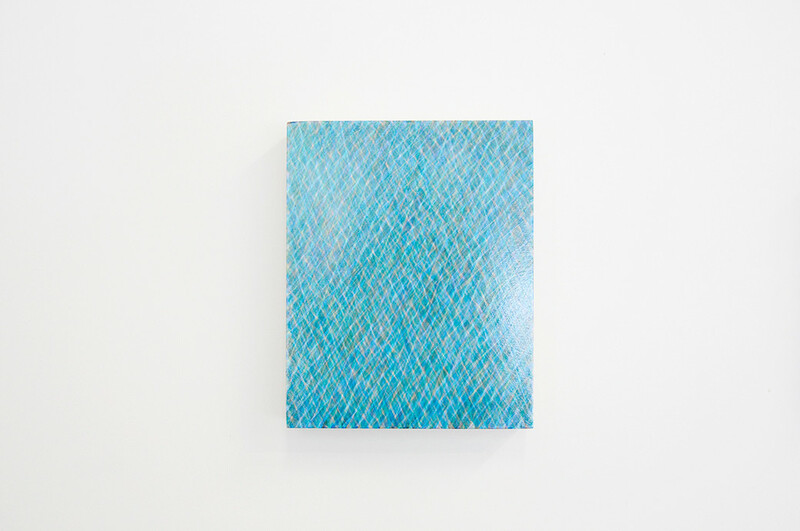 Jill Daves’ recent series of paintings titled I Just Can’t is a continuation of a project that initially began as site-specific installation that traced imperfections in gallery walls. Hastily hidden tiny divots from previous exhibitions were circled in long, rough spirals, exposing the history of the gallery. In I Just Can’t, Daves moves from the physical history of the space to the internal struggle for perfection. In these meticulous and deceptively small paintings, she attempts a simple task such as painting a straight line or a perfect circle with the awareness that she will never be able to satisfy her own impossible standards. In these repetitive actions, Daves finds solace. She describes the process as a balance between ‘obsession and reverence’. She respects the process so acutely that she is willing to undertake a project that is necessarily impossible. Natalya Hughes’ recent work is a conflation of painting, installation, and silkscreen printing that interrogates the relationship between the ornamental and the decorative, both historically uncomfortable terms for artists. Overlays of patterns simultaneously referencing wallpaper designers like William Morris and feminist artists such as Joyce Kozloff, seamlessly merge into complex and striking abstractions. Are they interpreted as art or decoration? Hughes doesn’t care. And this is where she excels. Her engagement in these contested territories strengthens her resolve. She speaks of her practice as the thing that binds her, that brings order. It is an enormous burden to place on art, but like Daves, Hughes seems to revel in the struggle. The work of Jill Daves and Natalya Hughes with its conflation of painting, politics, and space, with a clear possession of the term decorative would be unrecognizable to Denise Scott Brown in 1972. It engages the space of the gallery not as a generic white cube, but as a malleable and mortal thing. It embraces pattern and ornament with no trace of irony or hesitation. Originally published in the exhibition catalogue for "Jill Daves, Natalya Hughes."